I had a wonderful summer book study with my newest daughter-in-law, Alicia, who chose Girls with Swords for us to read. Although, I’ve seen Lisa Bevere multiple times on television this is the first time I’ve read one of her books. Not unlike her TV appearances, Lisa has a powerful message to share. Today many of the popular video games and comic book adventures depict women as heroes. But that certainly has’t been the norm of our social culture. Having not seen strong women modeled for us, many of us girls find it difficult to step into the role of warrior princess. 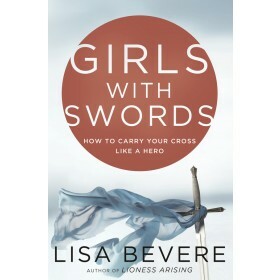 In Girls with Swords Lisa does a wonderful job using fencing metaphors to teach us the power we have available through The Sword of God’s Word. But before we can learn how to weald our sword we must first be aware of the battle set before us. Once we learn our battleground the task of becoming a warrior begins. We learn how to forge our sword, walk through the battle toward our harvest, armed with the Light, songs of praise and even times of silence. Lisa carefully teaches us that as God’s children we are chosen but we must be trained and armed before God will commission us to our individual battles. We may be chosen it’s up to us to attend boot camp. Only there will we get the preparation necessary for the battlefield of life. If you are looking for a book to study this Fall I highly recommend Girls with Swords! Also, you might want to check out the Girls with Swords Fencing Manual which goes beautifully with the book. It’s perfect for individual study or small groups. If you cannot see the video screen below Click Here for a message from Lisa Bevere.